Improve Senior Transitions from Hospital to Home with North Bay Home Care! Recovering from surgery can take some time, particularly for seniors. Not only are aging bodies slower to mend, but combined with diminished mobility and numerous directions for medications, physical activities, follow-up appointments, and nutritional constraints, there is a lot to keep track of after surgery. In a recent study led by IPC, The Hospitalist Company, nearly one out of five discharged patients needed assistance in a minimum of one area that had the potential to impact their recovery. Other similar studies show that bringing in care help for senior transitions reduces hospital readmissions. As the premier home care agency in the North Bay area, Hired Hands Homecare is available to help your senior loved ones with safe senior transitions home from the hospital by providing trusted senior care to help with recovery. We can start assisting with post-discharge planning soon after hospital admission to assess your senior loved one’s needs, ensuring coordinated efforts and continuity of care. Mr. L’s adult daughter is a busy working mother. When Mr. L needed to go in for minor surgery, his daughter didn’t know how she could possibly handle her father’s care once he was discharged. Hired Hands Homecare was there to help. By providing routine visits, our in-home caregiver monitored Mr. L, including his diet and activity levels, making sure medications were taken on time and the doctor’s plan of care was executed according to instructions. We delivered post-visit reports to Mr. L’s family, keeping them apprised on his recovery and notifying them immediately if we had cause for concern, or noticed the beginning signs of complications that could possibly lead to a readmission to the hospital. Additionally, we continuously reviewed Mr. L’s care plan for progress towards goals and any care changes that should be recommended were brought to the doctor’s attention. We understand that many seniors would prefer to recover in the comfort and familiarity of home. By working with you and following physician recommendations, Hired Hands Homecare’s compassionate and professional staff can carry out a plan best suited to care for your senior loved one. 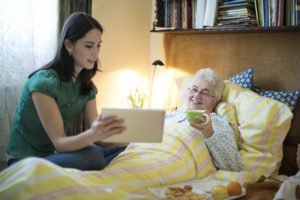 Making senior transitions home from the hospital successful, and keeping your senior loved one on the road to recovery is our number one goal. Call us today at (866) 940-4343 or fill out our online contact form to schedule an in-home assessment. We’d love to meet you and learn more about how we can help you and your senior loved one with in-home care in Marin, Sonoma, Napa counties and the Tri-Valley.